Tsechus have always been an integral aspect of Bhutanese culture. It attracts tourists and locals alike in the hordes. Yet, not many truly understand how these festivals originated and what they signify. So, ladies and gents, we present to you a brief history of the Tshechu, along with how and where it all began. The great scholar Padmasambhava of the school of Nyingmapa (the oldest of the four major schools of Tibetan Buddhism) visited Tibet and Bhutan in the 8th and 9th century. As bon practices and animist rituals were rampant then, he converted opponents of the Dharma by reciting mantras, performing rites and dancing to subjugate local spirits. His visit to Bhutan had been to aid the dying king Sindhu Raja. Padmasambhava performed a series of dances in the Bumthang valley which miraculously restored the king’s health. The king in return helped him spread Buddhism in Bhutan. And, so, Padmasambhava organized the first tshechu in Bumthang where the eight manifestations of Guru Rinpoche (Padmasambhava being the human form) were presented through eight forms of dances. These dances or Chams depicted the glory of Buddhism and were composed mainly to convey messages of the Buddha to the people. While some of the Chams were composed by Guru Rinpoche, others were created by Tertoen Pema Lingpa, Zhabdrung and other great saints. During the mask dances, the deities of the tantric teachings are invoked and through their power and blessings, misfortunes are removed. The dances it is believed suppress all evil spirits and demons that prevent the spread of Chhoe – the doctrine. The eleven-day annual Lhamoi Drubchen – a rite performed to appease the protecting deity Pelden Lhamo (Mahakali) – is held in September. Pelden Lhamo whose name translates into Glorious Goddess is the only female Dharma protector common to all four schools of Buddhism. She is one of the three main protecting deities of Bhutan. Although the Thimphu Tshechu was introduced in 1670, the Drubchen was instituted sometime between 1705 and 1709 by Kuenga Gyaltshen, the first reincarnation of Jampel Dorji – the son of Zhabdrung Ngawang Namgyal. According to legend, Pelden Lhamo appeared before him while he was meditating and performed dances. And based on the dances, Kuenga Gyaltshen initiated the Drubchen. Paro Tshechu is the most popular pageantry in Bhutan with the unfurling of the world’s biggest Thangka or Thongdrel ceremony. The mask dances commemorate the deeds of the great saint Guru Rinpoche. The locals attend the colorful festival to gain merit. 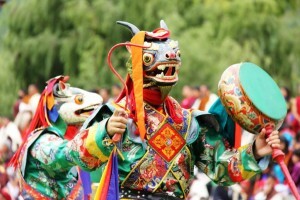 The Punakha Drubchen was introduced by Zhabdrung to commemorate the victories over the Tibetans. During the festival, the Pazaps or local militia men dress in battle gear and showcase a battle scene from the distant past. In the absence of a standing army, men from the eight Tshogchens of Thimphu and Punakha valley came forward and managed to expel the Tibetan forces from Bhutan. As for the Punakha Tshechu, it was started by the 70th Je Khenpo Trulku Jigme Choedra. The Thongdrel unveiled during the festival is of great significance. Measuring 83ft by 93ft, it is composed entirely of appliqué on 6,000 meters of silk brocade that took 51 artists two years to complete. The top half of the Thongdrel is devoted to the 11 manifestations of Zhabdrung’s lineage. The bottom half depicts Bhutan’s spiritual leaders including the current Je Khenpo. The Trashigang Tshechu takes place in the winter months. What attracts tourist to this festival is the nomadic people from Merak and Sakten with their unique costumes. The Kholong Tshechu in Trashigang, which begins in Yonphu towards the end of November, also draws a huge crowd not only because it is the oldest Tshechu in Eastern Bhutan but because of its name. Kholong – translated in Sharchopkha means a fight. So a precise interpretation would be ‘the fighting tshechu’. These circumambulations of the Chortens by the Dakpas (people of Tawang District of Arunachal Pradesh in India) and Drukpas (Bhutanese) are held in the first lunar month and are attended by people from all over the eastern region in Bhutan and from India. A popular belief is that when the stupa was constructed, a pious dakini princess from Arunachal Pradesh entombed herself within, as the Yeshe Semba, to meditate on behalf of all beings. Hence, devotees from Tawang in Arunachal Pradesh, India, join their Bhutanese counterparts in the Namgang Kora – one of eastern Bhutan’s oldest festivals which is held annually at the Chorten Kora in Trashiyangtse Dzongkhag. Trongsa Tshechu is held inside the vast Trongsa Dzong and is the oldest Tshechu in Bhutan. It is believed that the tshechus began to spread in Bhutan from Trongsa. This festival is held for duel reasons; to commemorate the establishment of the Jambey Lhakhang (temple) in the 7th century and to honor Guru Rinpoche who introduced tantric Buddhism in Bhutan. This festival is one of the most important in Bhutan and the highlight is the Mewang – the fire ceremony – and the Tercham – a religious dance. The fire dance is supposed to bless infertile women so that they may bear children. The Domkhar festival in Chumey valley in Bumthang was initiated by a preeminent scholar of Dranang in Tibet, Lam Kuenkhen Longchen Rabjam, in the 16th century. He promoted the special teaching of Dzongpo Chenpo (great perfection) and founded eight monasteries throughout the country. The festival held every year in April at the Domkhar temple is in his honor. This festival held inside Jakar Dzong is relatively a new one. It last for five days in mid-October during the ninth month of the Bhutanese lunar calendar. Tangsibi is a picturesque village near Ura Valley in Bumthang. This festival is held in the village temple starting from September 22 – 24. Held in the Prakhar Monastery in Chumey Valley in Bumthang, this festival takes place from October 23 – 25..